Andy H: As November is a five week month (well, in Comicland it is), my weekly pull seems smaller than usual and is mainly Marvel based. 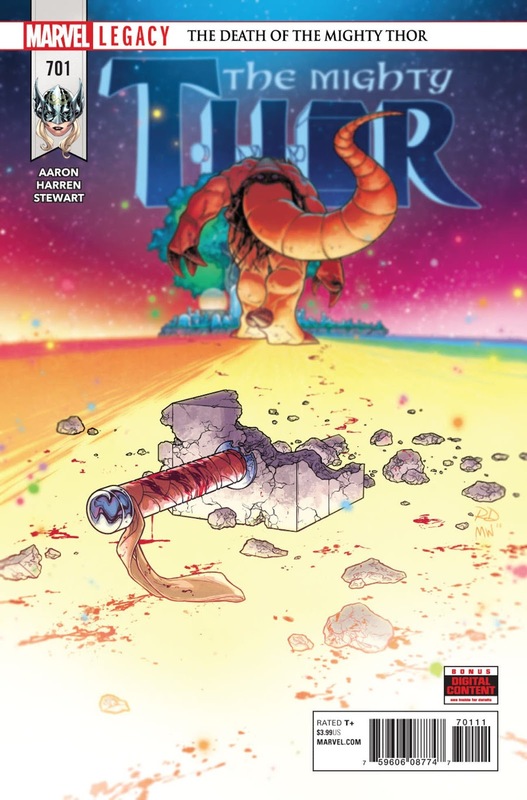 After last month's mahoosive Mighty Thor #700, we're back to a normal page count in #701. After the grim events of that last issue how will our leading lady and, come to think of it, any of the Thors out there, cope with the onslaught of Mangog? It's not looking good for our plucky heroes but then this story is called 'The Death Of The Mighty Thor'. Luckily Peter Parker: The Spectacular Spider-Man #297 is on this week's list and that's always good for a more cheery read. Of course poor old Peter Parker is never that lucky and is now wanted by the police. After a break last issue, Adam Kubert is back on art, another reason to keep me in that cheery mood. A cracking cliffhanger at the end of Avengers #673 means I can't wait to see what happens in this week's Champions #14. The High Evolutionary is up to his old tricks again and some familiar faces may not be so familiar any more! As crossovers go, the Avengers/Champions 'Worlds Collide' run has worked quite nicely. It helps that Mark Waid writes both titles so it jogs smoothly along. I will finish outside of Marvel and pick up Unholy Grail #4 from Aftershock. In this twisted tale of the Arthurian legend we reach the point where Lancelot and Guinevere are found out and I'm guessing it's going to get messy - really messy - judging by the direction this story has taken so far. Matt C: I've yet to read anything by Donny Cates but I hear good things from here, there and everywhere, so I feel I should investigate further, and what better opportunity could present itself than a 'relaunch' of Doctor Strange and a tale entitled 'Loki: Sorcerer Supreme' with art from The Vision illustrator, Gabriel Hernandez Walta? It seems like a promising combination to me! And if that doesn't hit the spot then I can rely on the similarly renumbered Thor #71 and Peter Parker: The Spectacular Spider-Man #297 to deliver the goods. Not subjected to the renumbering phenomenon but perhaps best of all is Hawkeye #12, featuring the continuing adventures of Kate Bishop and her trusty arrows. Diverting my eyes to Image, I see Generation Gone #5, Black Science #33, East Of West #35 but mostly Descender #25, which I think is my favourite of Jeff Lemire's many excellent ongoing series (just don't tell James R! ).